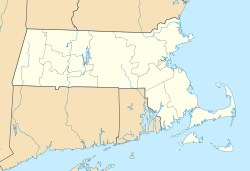 The bridge falls under the jurisdiction and oversight of the Massachusetts Department of Transportation (MassDOT). The bridge carries approximately 28,600 cars and 90,000 mass-transit passengers every weekday. A portion of the elevated Charles/Massachusetts General Hospital rapid transit station lies at the eastern end of the bridge, which connects to Charles Circle. Longfellow Bridge is a combination railway and highway bridge. It is 105 feet (32 m) wide, 1,767 feet 6 inches (538.73 m) long between abutments, and nearly one-half mile in length, including abutments and approaches. It consists of eleven steel arch spans supported on ten masonry piers and two massive abutments. The arches vary in length from 101 feet 6 inches (30.94 m) at the abutments to 188 feet 6 inches (57.45 m) at the center, and in rise from 8 feet 6 inches (2.59 m) to 26 feet 6 inches (8.08 m). Headroom under the central arch is 26 feet (7.9 m) at mean high water. The two large central piers, 188 feet (57 m) long and 53 feet 6 inches (16.31 m) wide,  feature four carved, ornamental stone towers that provide stairway access to pedestrian passageways beneath the bridge. Its sidewalks were originally both 10 feet (3.0 m) wide, but as of 2013 [update], for unknown reasons, the upstream sidewalks were narrower than the downstream ones. The new Cambridge Bridge viewed from Boston, sometime between 1906 and 1912. Streetcar tracks can be seen on each side, but the central rapid transit tracks are not yet in use. In 1898, the Cambridge Bridge Commission was created to construct "a new bridge across Charles River, to be known as Cambridge Bridge, at, upon, or near the site of the so-called West Boston Bridge... suitable for all the purposes of ordinary travel between said cities, and for the use of the elevated and surface cars of the Boston Elevated Railway Company." At its first meeting on June 16, 1898, Willam Jackson was appointed Chief Engineer; shortly afterward Edmund M. Wheelwright was appointed Consulting Architect. Both then traveled to Europe, where they made a thorough inspection of notable bridges in France, Germany, Austria and Russia. Upon their return, they prepared studies of various types of bridges, including bridges of stone and steel arch spans. The predecessor West Boston Bridge, circa 1864. Wheelwright had been inspired by the 1893 Columbian Exposition and was attempting to emulate the great bridges of Europe. Four large piers of the bridge are ornamented with the prows of Viking ships, carved in granite. They refer to a purported voyage by Leif Eriksson up the Charles River circa 1000 AD, as promoted by Harvard professor Eben Horsford. The piers are also decorated with the city seals of Boston and Cambridge. The main piers have sculptures that represent the prows of Viking ships. There are pedestrian stairs on both sides of the bridge at both ends adorned with stone towers. Originally, these led to the Charles River shoreline, and on the Cambridge side they still do. On the Boston side, the construction of Storrow Drive in 1950-51 moved the shoreline, so that the stairs now lead to isolated parcels of land cut off from the river by Storrow Drive. There is no way to exit the upstream parcel, due to an off-ramp; the downstream one includes a crosswalk past another off-ramp. To reach the Charles River Esplanade, pedestrians must now proceed along the sidewalk to the end of the bridge, and use the Frances Appleton Bridge, a wheelchair-accessible pedestrian bridge, at Charles Circle slightly south of the Longfellow Bridge. That summer the western sidewalk and inner traffic lane were both closed, the Red Line subway was limited to 10 miles per hour (16 km/h), and Fourth-of-July fireworks-watchers were banned from the bridge because of concerns that the bridge might collapse under the weight and vibration of heavy use. The speed restriction was lifted in August 2008, and the lane and sidewalk were reopened later on. Woman adds trophy to collection under the Longfellow Bridge in Cambridge, Massachusetts. In May of 2014, an anonymous local artist started placing a collection of trophies next to the pedestrian underpass on the Cambridge side of the bridge. During the renovation of the bridge, the trophy room went on hiatus, but the installation appeared again during the summer of 2018. ^ a b c d e f Jackson, William (1909). Report of the Cambridge bridge commission and report of the chief engineer upon the construction of Cambridge bridge. Printing department. Cambridge Bridge Commission. p. 42. Retrieved 2012-08-20. ^ Angelo, William J. (June 6, 2007). "Salt and Pepper Bridge Slated For Major Rehab in Boston". Engineering News-Record. The McGraw-Hill Companies. Retrieved December 11, 2011. ^ A Record of the Streets, Alleys, Places, Etc. in the City of Boston. City of Boston Printing Department. 1910. Retrieved 25 February 2017. ^ "Bridge Rehabilitation, Cambridge Street over the Charles River". Mhd.state.ma.us. Archived from the original on 2011-04-10. Retrieved 2011-08-31. ^ "MassDOT Highway Division: Longfellow Bridge Rehabilitation Project". Boston, Massachusetts: MassDOT (Commonwealth of Massachusetts). 2010. Archived from the original on 2010-08-04. Retrieved 2010-08-22. The bridge presently carries 28,000 motor vehicles, 90,000 transit users, and significant numbers of pedestrians and bicyclists each day. ^ "NEW BRIDGE OPENED". Argus Leader. Sioux Falls, South Dakota. August 23, 1906. p. 4. Retrieved April 24, 2018 – via newspapers.com. ^ "10,000 MARCH IN BOSTON". Chicago Tribune. August 1, 1907. p. 4. Retrieved April 24, 2018 – via newspapers.com. ^ Haglund, Karl (September 16, 2002). Inventing the Charles River. Cambridge, Massachusetts: MIT Press. p. 168. ISBN 978-0-262-08307-2. Archived from the original on October 11, 2012. Retrieved 2011-01-25. ^ "The Longfellow Bridge". Detroit Free Press. February 11, 1927. p. 6. Retrieved April 24, 2018 – via newspapers.com. ^ Longfellow, Henry Wadsworth. "The Bridge". Retrieved April 24, 2018 – via poetryfoundation.org. ^ Clarke, Bradley H. (1981). The Boston Rapid Transit Album. Boston Street Railway Association. p. 14. ASIN B0006EDDFO. ^ Westerling, David & Steve Poftak, A Legacy of Neglect, Boston Globe Op Ed., A11 (Jul 31, 2007). ^ "Internet2 blog". I2net.blogspot.com. 2007-05-02. Retrieved 2012-08-20. ^ Ebbert, Stephanie (2008-09-12). "Case of the purloined ironwork". Boston Globe. Retrieved 2008-09-12. ^ Ellement, John R. (2009-09-16). "Pair get jail for iron theft at bridge". Boston Globe. Boston, Massachusetts: New York Times. Retrieved 2009-11-14. ^ Viser, Matt (2008-08-05). "Patrick signs $3b bill to fix bridges". boston.com. Retrieved 2008-09-11. ^ a b "Accelerated Bridge Program (ABP) Plan - By Locality" (PDF). Archived from the original (PDF) on 2012-02-23. Retrieved 2012-08-20. ^ Ross, Casey, Longfellow's long list of woes Archived June 13, 2011, at the Wayback Machine, Boston Herald Special Report, (Jan 11, 2008). ^ "90 Day Integration Report - September 2009" (PDF). Archived from the original (PDF) on 2012-02-23. Retrieved 2012-08-20. ^ "Longfellow Bridge". Massdot.state.ma.us. Archived from the original on 2010-10-17. Retrieved 2011-08-31. ^ Brown, Sara (April 12, 2011). "Beacon Hill gets a Longfellow Bridge update". The Boston Globe. ^ a b MassDOT. "Longfellow Bridge". Accelerated Bridge Program. Commonwealth of Massachusetts. Retrieved 2 March 2013. ^ a b Powers, Martine (February 28, 2013). "Longfellow Bridge repairs, disruption to start in summer". The Boston Globe. Retrieved 2 March 2013. ^ MassDOT. "Longfellow Bridge Construction Animation". youmovemass. Commonwealth of Massachusetts. Retrieved 6 March 2013. ^ MassDOT. "MASSDOT BOARD APPROVES CONTRACTS FOR REHABILITATION OF LONGFELLOW AND WHITTIER BRIDGES". Retrieved 3 May 2013. ^ a b Dungca, Nicole (July 29, 2015). "Longfellow Bridge construction extended until late 2018". The Boston Globe. Retrieved 2016-01-22. ^ Dungca, Nichole (August 31, 2016). "Rebuilt Longfellow Bridge may reopen by June 2018". Boston Globe. Boston Globe Media Partners, LLC. Retrieved 23 September 2016. ^ Frias, Lauren (May 31, 2018). "5 photos of the Longfellow Bridge, which has reopened after years of construction". Boston.com. Retrieved May 31, 2018. ^ Vaccaro, Adam (2018-05-31). "After years of reconstruction, Longfellow Bridge reopened 5 a.m. Thursday". The Boston Globe. Retrieved 2018-06-01. ^ "The Mysterious Trophy Room Found under a Boston Bridge". 2015-01-22. Retrieved 2018-12-09. ^ Annear, Steve (2018-08-01). "The old trophies under the Longfellow Bridge are back. Here's why". The Boston Globe. Retrieved 2018-12-09. Jackson, William (1909). Report of the Cambridge bridge commission and report of the chief engineer upon the construction of Cambridge bridge. Printing department. Cambridge Bridge Commission. Retrieved 2012-08-20. Freeman, Dale H. (2000). A changing bridge for changing times : the history of the West Boston Bridge, 1793-1907 ; a thesis. University of Massachusetts Boston. ASIN B0006RH37A. Seitinger, Susanne (2002). "Lookin' Good, Feelin' Good: the transformation of Charles Circle" (PDF). Retrieved 2008-09-12. Moskowitz, Eric (July 25, 2010). "Linking cities and eras". The Boston Globe. pp. Pgs. 1–4. Retrieved August 7, 2010. Wikimedia Commons has media related to Longfellow Bridge. Wikimedia Commons has media related to Longfellow Bridge Rehabilitation. Daniel, Mac (January 22, 2006). "Longfellow Bridge lane to close". The Boston Globe. "Defects lead to closure of a Longfellow Bridge sidewalk". The Boston Globe. June 6, 2008. Archived from the original on June 11, 2008. Ebbert, Stephanie (June 7, 2008). "Longfellow Bridge is off-limits July 4th". The Boston Globe. Ebbert, Stephanie (June 26, 2008). "Two lanes closed on Longfellow Bridge". The Boston Globe.